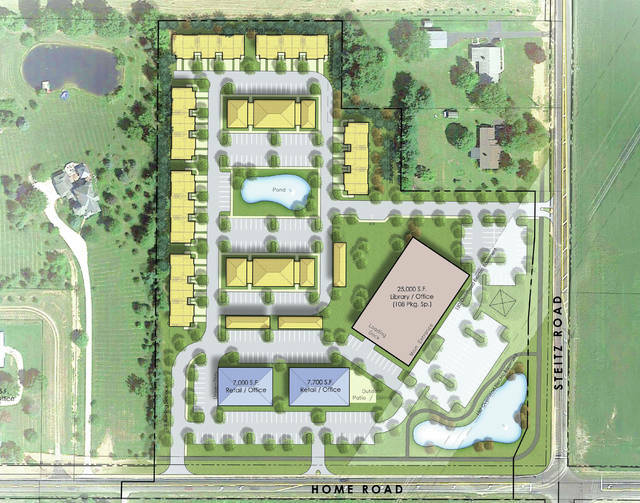 Pictured is a rendering of the proposed development at the northwest corner of Home and Steitz roads, just west of Indian Spring Elementary School and Liberty High School. The proposal calls for apartments (pictured in yellow), retail/office buildings (blue), and a 25,000-square-foot library/office building (red), which could be the future site of a new Delaware County District Library branch. After the Delaware County District Library (DCDL) levy renewal was passed by voters on Nov. 6, Director George Needham said the expectation was to move quickly in identifying a location for the new Powell branch that is to be built. At Wednesday’s meeting of the Powell Planning and Zoning Commission, some insight was given on just where that location may be. The northwest corner of Home and Steitz roads in Liberty Township had been a hot topic recently as developer John Wicks sought this past spring to develop the nearly 12 acres for multiple purposes that included a gas station, office buildings and storage units. The proposal was met with considerable outcry from neighbors and was ultimately turned down by the planning and zoning commission. On Wednesday, Wicks was back in front of the commission with a sketch plan for a revamped proposal that now features apartments, office buildings, and, most notably, the newest branch in the DCDL system. Wicks said he and his team spent considerable time with residents following the last proposal’s defeat to better understand what residents are looking for and would ultimately support. One suggestion Wicks heard from residents was the potential for a library branch to be built on the corner. After reaching out to DCDL, Wicks was pleasantly surprised to learn that, pending the passing of the levy renewal, DCDL would, in fact, be looking for a new location in the Powell and Liberty Township area. Gary Smith of G2 Planning, on behalf of Wicks and Home Steitz LLC, detailed the new proposal for the commission. Among the concerns he addressed surrounding the apartment portion of the development were density and lack of green space. Smith pointed out that in order for the site to work, both the library and the retail and apartment portion of the development would be dependent on each other — neither would work on their own. Kevin Daberkow, a teacher and resident of nearby Scioto Reserve, pointed to the number of schools in the area and the inability to get to any of the other library branches after school hours, due to traffic in the evening and sheer distance, as obvious reasons that speak to the need for a library branch in the area. He cautioned the commission and city staff that changes to the site plan, such as removing units to hit a particular density figure, could affect the feasibility of the site for the developers and, in turn, steer DCDL away from building their new branch at that location. “We want the library, so I trust that folks that know more about density than I do can work out that issue so that we can make sure that it’s worthwhile for Mr. Wicks to develop that as a library,” Daberkow said. Commissioner Shaun Simpson proposed the biggest and most obvious question to the site’s future: What happens if the library decides to build elsewhere and is no longer part of the development’s plan? Comments from the commission were generally supportive of the initial step in the development, and all applauded the efforts of the developers and the residents to work together on a plan that both sides could be excited for. The next step for the proposed site plan is to come back to the planning commission as a preliminary development plan. The next meeting is scheduled for Wednesday, Nov. 28. Meetings begin at 7 p.m. and are held in the council chambers of the municipal building, located at 47 Hall St., Powell.